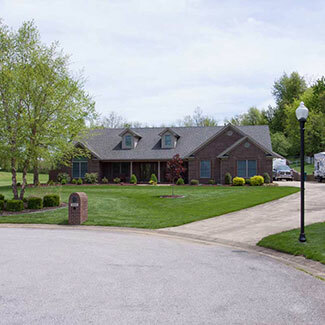 In 1986, Robert Hill began building custom homes in and around the Owensboro, Kentucky area under the operation of a proprietorship. He spent years honing his skills while completing much of the rigorous labor involved in building a custom home. In 1995, he incorporated his business as Hill Custom Homes, Inc., and the team has been helping their clients bring their dreams of homeownership to life under that brand. Mr. Hill firmly believes that a home can be seen as the center-point of a family: it’s where folks gather with their friends and extended family; where children grow and mature into adults, and where precious memories are cultivated. Therefore, Mr. Hill realized when starting the organization that something so critical to the daily life of a family should be built with the highest attention to quality materials and craftsmanship available. The home should also be built around the family’s needs and desires – not around a “standard” floor plan that can not adapt to such needs. Finally, the home should also be comparably and affordably priced, bringing an overall value to the customer that is seldom found elsewhere. When you choose Hill Custom Homes to build your family’s next home, you’ll receive the highest of quality, value, and commitment found in the area. They take pride in their work, stand behind their homes, and they always put customer service as their top priority. Hughes Construction & Remodeling Co.